From start to finish--and even throughout its post-show Q&A--Full Circle Souljahs's Boxed In aims to smack down barriers between dance techniques and traditions as well as who can and should perform what. If you think you've got classical ballet over here in this corner and street dance way over there on that far end and maybe a few discrete modern and postmodern things floating between, this hour-long show will simply break up alla that. 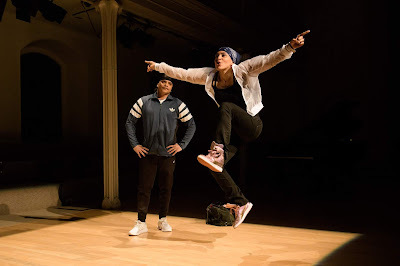 Holding court at Danspace Project now through Saturday evening, the troupe is the winning handiwork of two famed Bronx street dance veterans--the married couple of Kwikstep and Rokafella. Diverse in race and ethnicity, Full Circle Souljahs collective is also remarkable for its performers' diverse training background. And that's the point of Boxed In. What all have in common is a passion to do their art, to perform, and most have eagerly soaked up experience from all sectors of their art. Watch stately Shaneekqua Woodham and gymnast-sleek Odylle "Mantis" Beder switch gears from ballet to b-girl moves, you realize that you're looking at the smart, multiple dimensions of today's youth and their can-do spirit. The show includes sequences that suggest the two choreographers might have Broadway audiences in mind--for example, the cirque nouveau-style Cyr wheel hooping of Gabriel "Emphasis" Alvarez who eventually puts distance between himself and some vaguely menacing characters in commedia dell'arte masks. The piece deals with issues of ambition, the temptation to sell out and the wonder of freeing your creativity to work outside of set rules, categories and expectations. It’s the sort of show that would be great for youngsters, and there were many in the smallish opening night audience with parents plus a contingent of college students. People I did not see: the typical “downtown” Danspace Project audience. The troupe has two more shows, and—who knows?—that might change. But maybe the message they’re bringing—step out of whatever box confines you—needs to reach more of us. Boxed In continues through Saturday, May 19 with 8pm performances at Danspace Project. For information and tickets, click here.